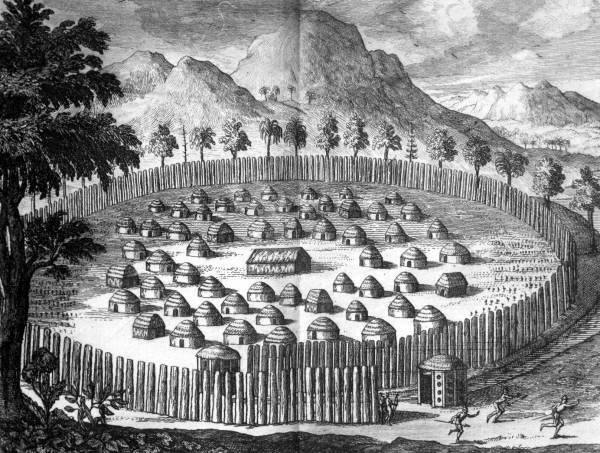 This picture of a Timucua village is about 400 years old. There are at least two things wrong with it: First, there were no mountains in Florida. Second, fences or palisades probably didn’t surround Timucua villages. The depiction of an enclosure runs counter to most of the evidence uncovered by historians and archaeologists. VISITING A VILLAGE — Here’s a Timucua village at a glance: Its residents often numbered from 50 to 300 individuals, and they lived in windowless huts that may have stood about 75 feet apart. These structures were small and round, only about 25 feet in diameter. The huts consisted of tree trunks driven into the ground in a circle. The tops of the trunks were probably bent together and tied. Over this wooden frame, palm fronds were woven into a strong, waterproof cover. The builders left a short door on one side and a smoke hole in the roof. Apparently, no mud or clay was utilized. LET’S GO INSIDE – Benches likely lined the inner walls of a hut. These were probably used for sleeping, with animal furs for comfort and warmth. At night, a small, smoking fire could be lit beneath the benches to try to keep bugs away. A space inside a hut was also set aside for a cook fire and for the storage of food and personal items. OTHER STRUCTURES — A village may have also featured a small temple building. Other structures could have included storehouses for food and huts for women recovering from childbirth. The largest and most impressive building was the Council House, which contained benches that could seat all of the inhabitants. This round or oval building provided space for ceremonies, meetings, dances, and community celebrations. Despite what some writers say, there is no evidence that Council Houses were square shaped. OUTDOOR LOVERS — The Timucua preferred to spend most of their time outside. They usually huddled in huts only at night or during stormy weather. Recreation of a Timucuan hut. 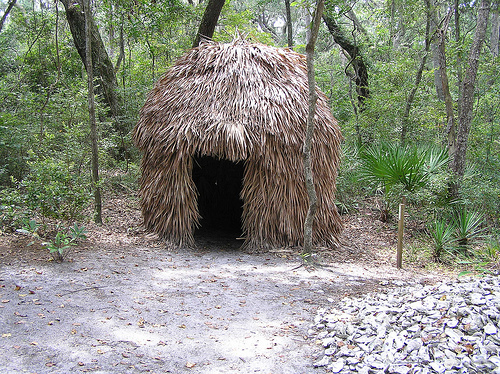 A recreation of a tiny Timucua hut can be found at the Timucuan Ecological and Historic Preserve in Jacksonville. It’s made of palmetto leaves and measures about 12 feet in diameter. This structure is similar to one that the Timucua once erected for a local Indian leader. He used it as he watched the construction of France’s Fort Caroline. The Preserve’s hut is smaller than those usually contained in Timucua villages, but it may give a feel for indoor life at the time. As a visitor enters the little structure, he’s struck by how stuffy, dark, and claustrophobic it is. These feelings are little relieved by a small “skylight” left at the rooftop. It also seems as if a snake or bug will drop down at any moment. No wonder the Timucua spent so much time outside! TIMUCUA DUVAL COUNTY — There were at least 20 Timucua villages in the area that is now Duval County. The Timucua built all of the villages on riverbanks. The average distance between them was two miles. Most of the riverside villages sat in maritime hammocks. These are small forests perched atop ancient sand dunes or shell middens. (Middens are large Native American mounds made of shells, broken pottery, and other refuse). Maritime hammocks become established on dunes or middens that are stable enough to support the growth of trees. Plant species in maritime hammocks include live oak, cabbage palms, wild coffee, coral bean, and several types of ferns. The hammocks also bustled with animal life. They provided homes for tree frogs, squirrels, scrub jays, blue-tailed skinks, songbirds, and numerous other creatures. Why did the Timucua choose hammocks for their villages? These locations offer easy access to water. The sites are also well drained, and were not often visited by large, destructive fires. Unfortunately, few maritime hammocks still survive. Lumbering stripped many of the old hammocks, and streets and subdivisions cover most of them today. The prized land of yesteryear has become today’s prime real estate. Transcription taken from Discovering the New World, Based on the Works of Theodore de Bry (1591), edited by Michael Alexander (New York: Harper & Row, 1976). This is how the Indians construct their towns: they choose a place near a swift stream and level it as much as possible. Next they make a circular ditch and fix in the ground, very close together, thick round palings the height of two men. At the town’s entrance they make the opening of the circle narrower, in the form of a spiral so that this entrance does not admit more than two men abreast at a time. The course of the stream is diverted to this point. At the beginning and end of this passage a round edifice is erected, full of holes and slits which, considering their means, are constructed very elegantly. In each, sentinels who are expert at smelling the enemy from afar are stationed. As soon as they detect the scent of the enemy, they rush out, shrieking, to find him. At this alarm the inhabitants of the town run out to defend their fortress, armed with bows and arrows and clubs. The king’s dwelling is in the middle, and has been a little sunk into the ground to avoid the sun’s heat. All around it are grouped the nobles’ houses, lightly constructed and roofed with palm branches. As has been mentioned earlier, they only spend nine months of the year here, emigrating to the forest for the rest of the time. They make new houses with the same materials, if, on their return, they find they have been burnt down by the enemy. Thus magnificent are the palaces of the Indians.